Australian’s fail to live up to hype on Olympic stage! The Olympics is over and it was a hugely successful event in Rio. Usain Bolt cemented his legacy as the greatest sprinter we’ve seen with more gold medals to add to his impressive haul. Elsewhere, Michael Phelps became the most decorated Olympian of all time with more success in the pool. However, while those achievements deserve many accolades, here at Lucky Nugget Casino we are feeling patriotic. So, instead we will be focusing on Australia, and giving the lowdown on how our athletes fared at the summer games. How did it compare to London 2012? Well, there wasn’t that much difference – at all. In London, Australia were 10th in the medals table and Rio 2016 has produced the exact same finish. The team managed to win eight golds which was an increase on the seven won in 2012, however the total medals won was down from 35 to 29 which disappointed those involved who had targeted significantly more gold medals and a higher total in general. In terms of where the medals were won, similarly to London, most of the medals (10) came from swimming and they improved the return of gold medals with three compared to one. Rowing and sailing made up the top three events in 2016 compared to rowing and cycling in 2012. The rest of the gold medals came from; shooting, sailing, rugby sevens, rowing and modern pentathlon. Given the funding and facilities available, the AOC chiefs had boldly predicted that the team would return with 17 goal medals, which would lead to a top five finish. The reality saw eight gold medals make their way back to the country. The decision to announce that 17 gold medals were expected is said to have annoyed the athletes and caused unnecessary pressure ahead of the games. However, a review will now take place into what went wrong, with those in charge taking the responsibility to ensure that the levels of funding and support is rewarded with gold medals in four years time in Tokyo. Despite swimming producing the most medals for the team, there was still huge disappointment from those involved. Sports Illustrated had suggested prior to the Olympics that eleven gold medals should be targeted from swimming alone, and that was something that Coach Jacco Verhaeren wouldn’t dismiss in the build-up. The chief reason for those results was the poor performance from some of the bigger names in the sport. 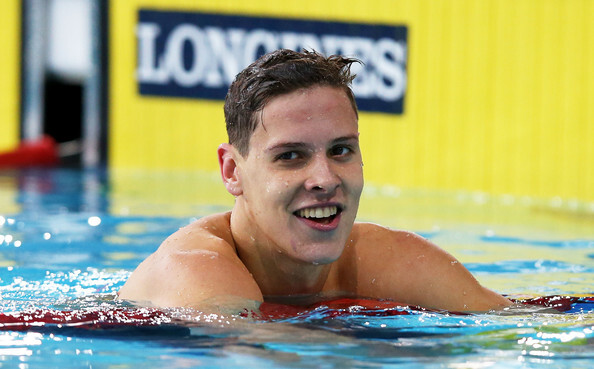 100m and 200m backstroke world champion Mitch Larkin was hopeful of bringing back two gold’s in his event, given his status. However, he would go on to earn silver in the 200m and just 4th position in the 100m. Emily Seebohm, who is in a relationship with Larkin, actually holds the same titles as her partner, but the world champion could only finish 7th in the 100m final, but failed to make the final in the 200m. Cameron McEvoy entered as the Commonwealth record holder and only managed a 7th place finish, whilst Cate Campbell is the world record holder for the 100m freestyle and had hoped for a gold-silver combination with her sister Bronte, yet could only manage a 6th placed finish. With all of the big names failing to deliver, it was left to the swimmers without the same expectation to deliver the gold medals. Kyle Chalmers managed to power his way to victory in what was a fantastic result for the 18-year old and Mack Horton was a surprising winner in the 400m freestyler. Yet, that wasn’t the big story, the failure of the big names to deliver and a weak return of three gold medals was the issue. In fairness to the swimmers, there were other events where the Australian favourites failed to deliver. Defending Olympic champion Anna Meares could only come 10th in the cycling sprint, whilst Lauren Wells could only come 7th in the 400m hurdles. Elsewhere, in the basketball, women’s football, men’s hockey and rugby seven’s, all would succumb to a quarter-final exit. The question that everyone involved with Australian sport would like to know. Again, to stress, this wasn’t a major failure, but clearly too many athletes underperformed and didn’t reach their potential, and it will be up to the AOC to work out why. Does funding need to be cut? Do they need it be increased? Are they overrated? All of these questions will come up and they will have to be answered at some point. $340m was ploughed into making this Olympics memorable for the country, and spending such money proves that results don’t necessarily follow, so throwing further investment at it isn’t the answer. That suggests deeper problems with those involved. The way the money is currently distributed, was through a much publicised ‘Winning Edge’ formula that saw investment in sports depending on our likelihood of success. Basically, the more chance we had of winning gold, the more money they got. However, that clearly did not work and is the chief reason for the disappointment. Having a root and branch review might be exactly what the country needs if they are to improve sufficiently for Tokyo in four years’ time. Rio was just the latest in what has been a steady decline at the Olympics since hosting it in Sydney way back in 2000. So, there you have it, Rio was ultimately a poor showing from Australia on the Olympic front. That’s not to diminish the achievements of some of the fine athletes who represented the country and have returned with medals, yet it won’t get away from the fact that this Olympic games will not be fondly remembered at all given the loft expectations. Hopefully, the problems will be rectified in time for Tokyo and whether the money is distributed differently or a review into the levels of coaching, Team Australia will hope that they can build up to matching the levels of medals that were recorded 16 years ago.